I stopped attending SXSW as a journalist in 2000. I’d gotten pretty burned out running the magazine, so I decided to take a break and focus on my web work. Little did I know, 5 years later I’d be back because a site I built was a finalist in the Interactive Awards. At the time, the panels for Interactive occupied roughly 3-4 rooms upstairs, in the far corner of the Convention Center. We were the AV club to Music & Film’s jocks and cool kids in the high school cafeteria. But, to me, walking into that corner was like swimming up to a coral reef teeming with schools of incredible fish. I recognized so many of our industry’s luminaries as I floated through: Eric Meyer … Jeffrey Zeldman … Jason Fried … Tantek Çelik … These were people whose blog posts and articles had helped me solve issues I was having, people that helped me hone my craft, people that were indirectly responsible for me being there as a finalist in the awards. And unlike the reef fish, they didn’t spook when I saddled up to them and said hello. 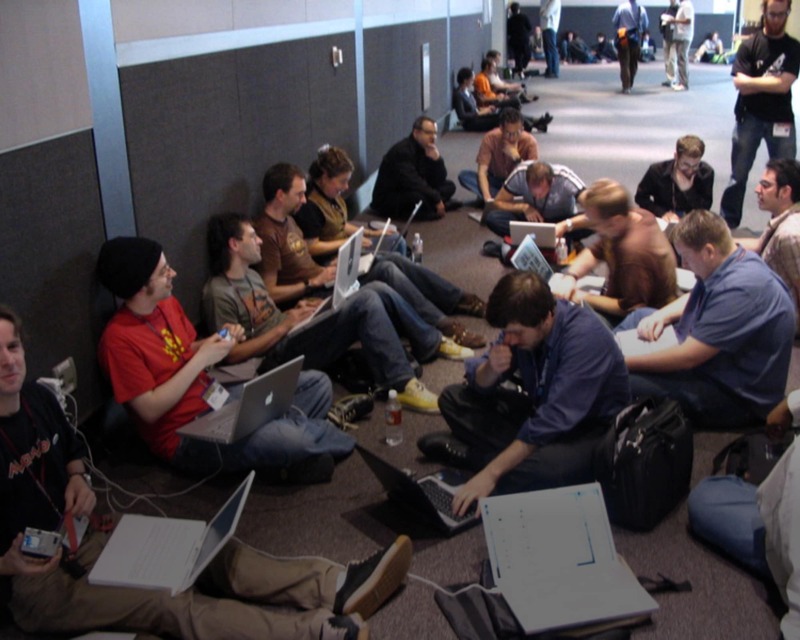 Younger versions of ourselves: Ian Lloyd, Ethan Marcotte, Andy Clarke, Andy Budd, Glenda Sims, Jeffrey Zeldman, Richard Rutter, Shaun Inman, Rob Weychert, Faruk Ateş, Jon Hicks, and more sprawled on the floor. Everyone was incredibly friendly and I was amazed when they invited me to join them as they sat on the floor and leaned against the walls between and during some of the sessions. The hallway became our meeting place and I began to meet more amazing people, many of whom were just starting to make a splash in our then-young industry: Jeremy Keith, Andy Budd, Richard Rutter, Matt Mullenweg, Jason Santa Maria, Jon Hicks, Rob Weychert, Ethan Marcotte, Ian Lloyd, Cindy Li, and Faruk Ateş to name but a few. Together we bonded on those dirty, industrially-carpetted conventions center floors and those relationships became friendships and grew into new businesses and ventures. I am incredibly thankful for the opportunity I had to go to SXSW that year. I’m thankful for the carpet and the hallways. And I am ever so thankful for the friends I made there, friends that I still hold dear nearly 10 years later. It’s hard to believe that SXSW Interactive is 20 years old. Reading through the remarks and stories in this awesome piece from Fast Company, I felt inspired to share some of my SXSW stories. This is the second.